Did you know that breathing in certain perfumes could cause your body serious and permanent damage? According to one study, many popular perfumes contain harmful substances (which manufacturers are not legally obliged to list) that are linked to sperm damage, hormone disruption, various cancers, reproductive toxicity, and allergy problems. And even if YOU decide to ditch the lethal scents, one whiff of someone else’s aftershave could make you seriously ill.
Perfume ingredients may smell good to some people (while giving headaches to anyone sensitive to the fumes), but a 2010 study suggests popular brands reek of long-term health problems for all of us. The researchers found that labels of popular perfumes don’t list harmful perfume ingredients linked to sperm damage, hormone disruption (which is linked to some cancers, thyroid disease, obesity, diabetes, and other serious health problems), reproductive toxicity, and allergy problems. 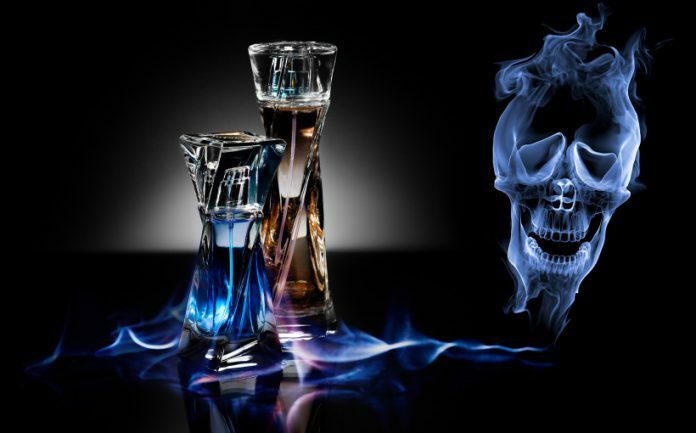 And chemicals that may play a role in cancer were found in many of the fragrances analyzed. 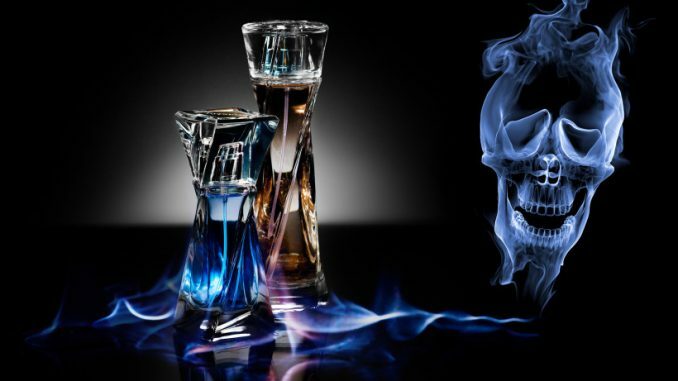 “This monumental study reveals the hidden hazards of fragrances,” says Rodale.com advisor Anne C. Steinemann, PhD, professor of civil and environmental engineering, professor of public affairs, University of Washington. And, as with smoking, it’s not just the person using the product that’s affected. “Secondhand scents are also a big concern. One person using a fragranced product can cause health problems for many others,” she says. The analysis, performed by the nonprofit Campaign for Safe Cosmetics, a group with coalition members from the Breast Cancer Fund, Environmental Working Group, Clean Water Action, and other public and environmental health organizations, found that many top-selling fragrance products contain a dozen or more secret chemical ingredients not listed on the labels, and multiple chemicals that can set off allergic reactions or disrupt hormones. Many have never been tested for safety on humans. • Ten sensitizing chemicals associated with allergic reactions like asthma, wheezing, headaches and contact dermatitis. Giorgio Armani Acqua di Gio contained 19 different sensitizing chemicals, more than any other product in the study. • Four hormone-disrupting perfume ingredients linked to a range of health effects including sperm damage, thyroid disruption, and cancer. Halle by Halle Berry, Quicksilver, and Jennifer Lopez J. Lo Glow each contained seven different chemicals with the potential to disrupt the hormone system. • American Eagle Seventy Seven contained 24 hidden chemicals, the highest number of any product in the study. Medical and public health experts from Harvard and the University of Washington peer-reviewed the study. Just because your favorite fragrance wasn’t on the list doesn’t mean it’s safe. In fact, harmful perfume ingredients are used in thousands of products and are not listed on the label. It seems like you should have the right to know how these seemingly innocent perfumes and colognes are affecting your health. But unfortunately, manufacturers don’t have to list warnings or even the actual ingredients used in fragrance blends, on the label. The problem isn’t limited to perfumes and body sprays. We are blasted with harmful synthetic fragrances everyday in the form of scented cleaners, hair spray and dyes, air fresheners, candles, shampoos, soaps, perfumes, and body sprays. Research is finding that many of these scented products interfere with our hormones, which regulate how our bodily systems function. Mess with that, and the risk of diabetes, some cancers, obesity, thyroid disease, and all sorts of ailments seems to increase. You may not think that all these fragranced consumer products bother you, but try giving them up for a few months—after that, you may find that being exposed to them really makes you feel lousy. Here’s how to give harmful perfume ingredients and other household fragrances the cold shoulder. • Smell good without a toxic cloud. If you want a scented product, make sure it is scented with pure essential oils that were extracted through a cold-press process, not by using solvents. You can also visit Environmental Working Group’s Skin Deep Cosmetic Safety Database to find safer fragrances and other personal-care products. • Look at the labels. Personal-care products must list ingredients on the label, although there is a trade secrets loophole for fragrance blends. Manufacturers can use the blanket term of “fragrance” or “parfum” on the label, but thousands of different chemicals—many petrochemical and volatile organic compounds—can hide under that description. Your best bet is to avoid any personal-care product listing these ingredients: fragrance, perfume, parfum, linalool, and limonene. • Clean green (and save money). Isn’t it ironic that we’re actually polluting our homes with “cleaning” chemicals? Unlike personal-care products, cleaners and air fresheners don’t have to disclose inactive ingredients, which can contain chemicals that are hazardous to our health. Stock up on tried-and-true green cleaning recipes. These homemade cleaners effectively kill germs, often using the power of white vinegar, and can save you lots of money annually. • Light one for the bees. Put the lights out on burning fragranced candles, which are packed with hormone-disrupting chemicals and air contaminants found in car exhaust, and choose beeswax candles instead, which don’t pollute, and actually improve indoor air quality by boosting negative ion levels in your home.